Measuring the flow rate of dust, powders or granules in a pipe or duct has now become possible with the use of the SolidFlow 2.0 sensor. The sensor uses state of the art microwave technology which is converted via an evaluation unit which then will indicate a flow rate of the product at that point of the pipe or duct. This output is either via a 4-20 mA current signal or as a pulse output. The SolidFlow 2.0 can measure the mass flow rate of particles in a pneumatic conveying line or in a duct in a free flow application after a mechanical feeding device. The sensor can be used for almost any particles ranging from 1 x 10-6 mm up to 10 mm in size and for a maximum mass flow rate of 20 t/h. The SolidFlow 2.0 sensor is used in metal pipes or ducts. For diameters over 200 NB two or three sensors must be used which are either fitted at 90° or 120° from each other. The microwave technology of the sensor creates a homogenous measurement field within the metal pipe. When solid particles pass through this filed, the microwave radiation is reflected and received by the sensor. Both the frequency and the amplitude of the received signal are analysed and processed. The standard SolidFlow 2.0 sensor is suitable for pipe pressures up to 1 bar and a maximum temperature of 80°C. The optional version can be used in applications with an operating pressure of 10 bar and a temperature of 200 °C. The sensor does not obstruct the material flow and is mounted flush with the ID of the pipe or duct. It can easily be retrofitted onto any metal pipe by means of a dedicated mounting socket to be welded onto the pipe, using the socket as a guide, a hole is drilled into the pipe. The SolidFlow 2.0 can even measure through non-conductive sleeves of a metal pipe e.g. wear liners. Thus, there is minimal maintenance required for these units unlike other mass flow measuring devices such as impact plates. 1. Dosing of spices for manufacturing potato chips: The SolidFlow 2.0 is installed after a dosing feeder so that the amount of spices added (14 kg/h) can be measured and controlled. 2. Measurement of quicklime in free fall from a screw conveyor after a mill: The SolidFlow 2.0 measures the lime flow that varies from 6 to 15 t//h. 3. 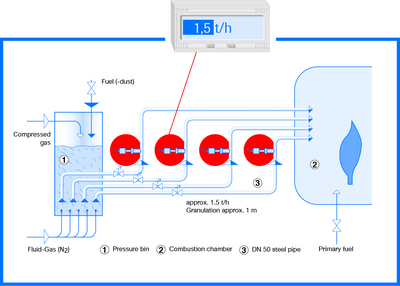 Flow metering of sodium aluminium phosphate in a pneumatic conveying system of a pharmaceutical company: The SolidFlow 2.0 provides the client accurate readings of the conveyed volumes which is critical for the quality control system. 4. Carbon dust feed measuring into the secondary firing of a rotary kiln: The SolidFlow 2.0 measures the flow rate of 10.0 to 11.0 t/h of coal dust into the rotary kiln. 5. Flow metering of maize meal in free fall: The SolidFlow 2.0 is installed after a rotary conveyor to record the consumed volumes and ensure the correct mixing volumes in the production of maize products.